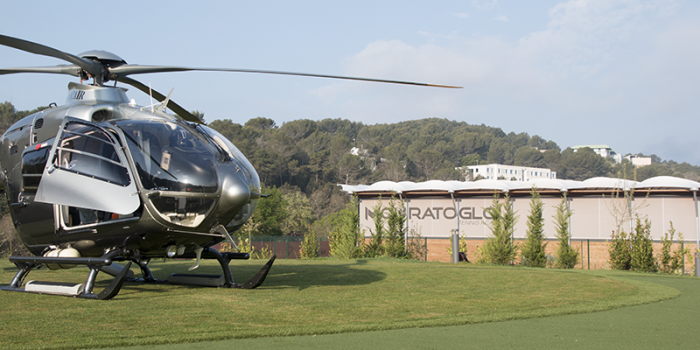 Nestled between Nice and Cannes, at the heart of the French Riviera, the Mouratoglou Resort is a top-notch complex that stretches over 12 hectares of state-of-the-art facilities and 4-start hotel. 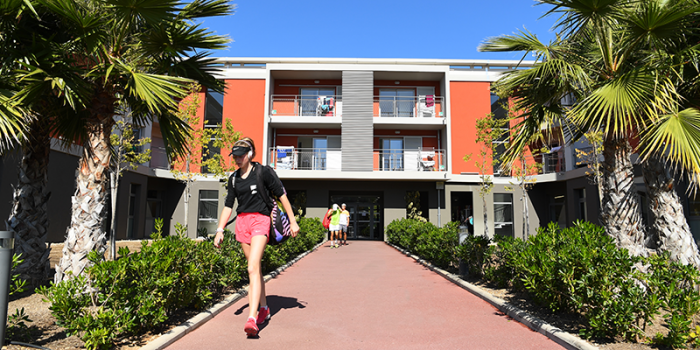 With more than 320 days of sun per year, the Mouratoglou Resort offers incredible conditions for intensive tennis practice and is considered as the world’s most proficient training centre. This 4-star hotel, located in the heart of the Mouratoglou Resort, is the perfect pied-à-terre for everyone willing to spend family holidays in a sports and leisure environment. 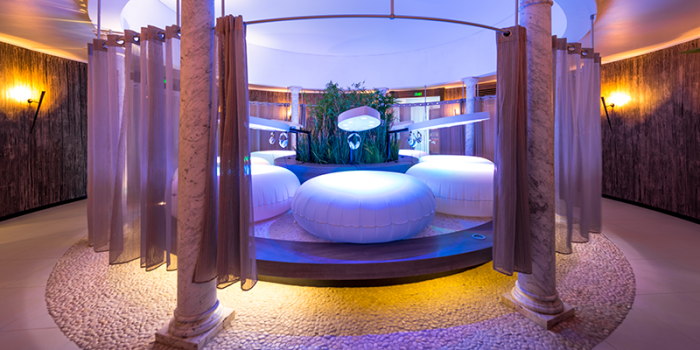 This luxurious 700-m² spa helps you strive for balance between mind and body. 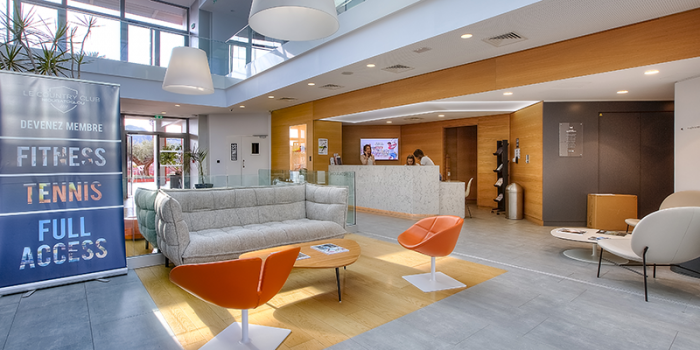 Custom-made beauty care, a sunny terrace and a tea bar: Everything has been thought out to enhance your well-being. 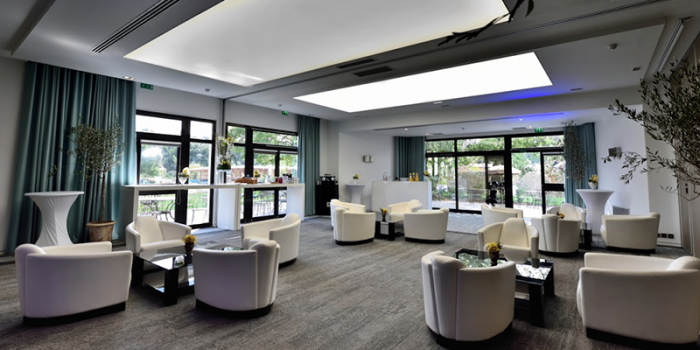 Rent a spacious room in Sophia-Antipolis for your seminars, conventions and professional meetings. Our restaurant is located in the heart of the Mouratoglou Resort, inside the Beachcomber Hotel & Spa. It is open any day of the week and known for its excellent meals. With 300 days of sunshine a year, the French Riviera invites you to have a little swim. 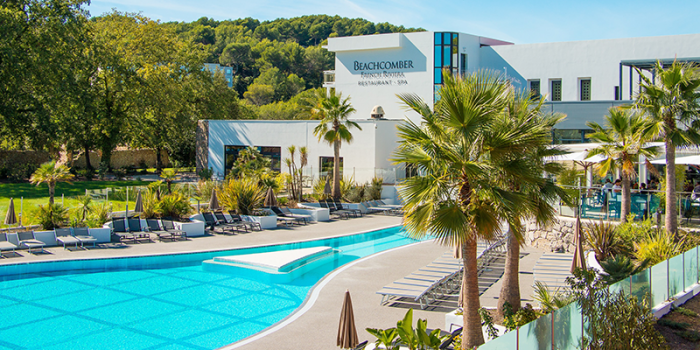 Take advantage of the Beachcomber Hotel French Riviera’s two swimming pools – including the iconic racket-shaped pool – to do so. 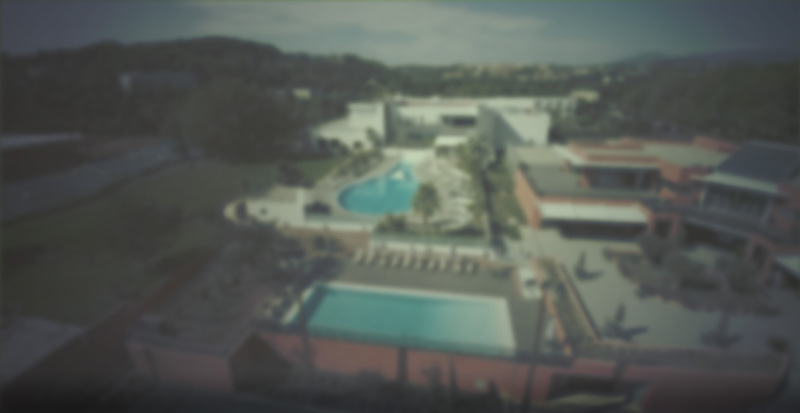 Nestled between Nice and Cannes, the Mouratoglou Resort is a top-notch complex that stretches over 12 hectares of state-of-the-art facilities. With 34 courts (clay, hard and indoors), a medical center, a student campus and its iconic racket-shaped swimming pool, it is considered as the world’s most proficient training center. Welcome to tennis paradise. Every tennis venue needs a center court to shine. 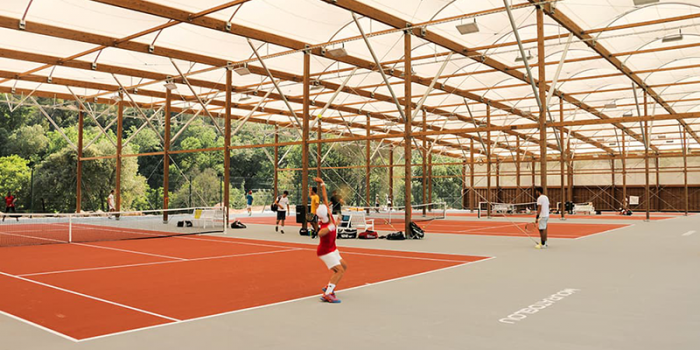 The Pierre Andurand Center Court – named after one of the main Champ’seed Foundation donors – is a clay tennis temple that will convert into an ATP event center court for the 2019 Mouratoglou Open. 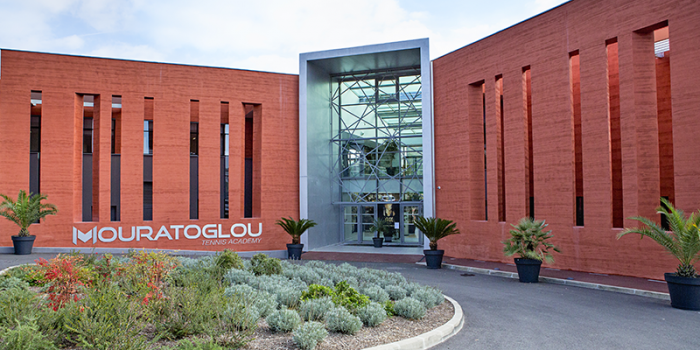 At the Mouratoglou Academy, the campus is on site, where the school and the courts also are. Every detail has been considered to provide the comfort and equipment needed for all of our players. 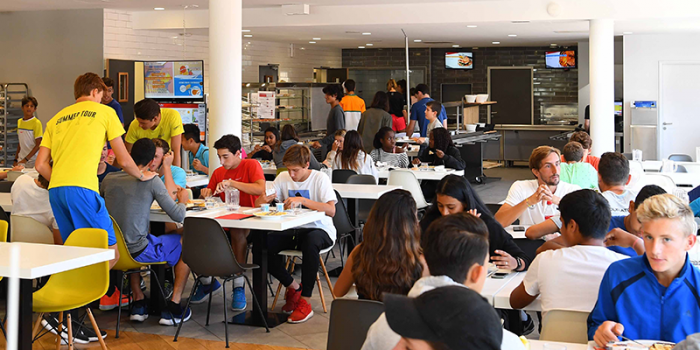 For more than 20 years, our Tennis & School program has been providing our students with a top-notch sports and studies education combining intensive training, tournaments and adjusted schedule classes throughout the year. 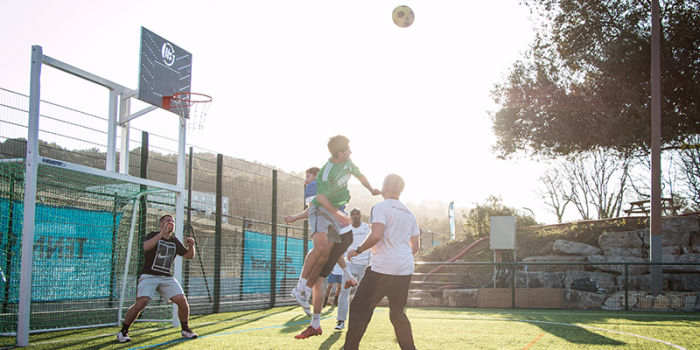 Where our student-athletes and tennis campers do their fitness sessions and play basketball, football and many more sporting activities. As being professional also means taking care of what you eat, our meals have been designed with an internationally renowned French sports nutritionist in order to provide the right balance of nutrients and meet the rigorous physical challenges of our sports athletes. Healthy, varied meals are all prepared on site and are tailor-made for athletes. Make a grand entrance, the Mouratoglou way. 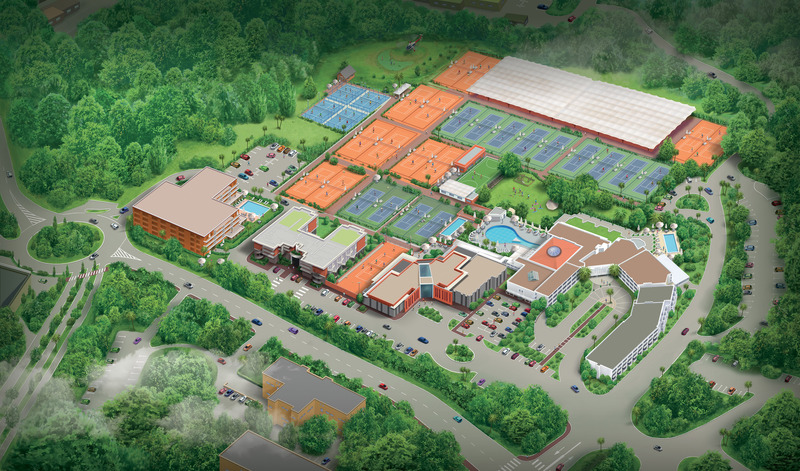 Eight indoor courts so that the professional players can prepare for the indoor season. Also helps in the (rare) event of rain for our student-athletes and campers. You’ll always find a coach available should you need anything. 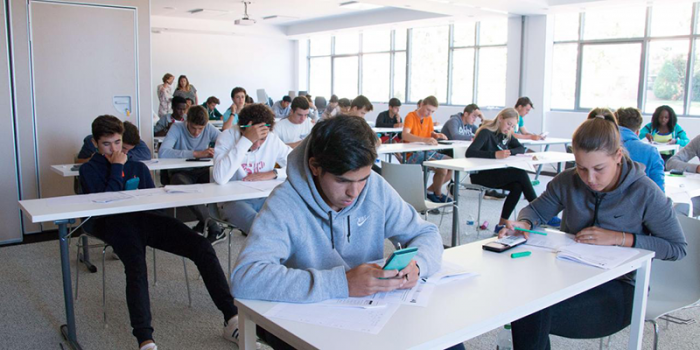 Book tennis or padel courts, get info about camps or other products, sign in for Country Club classes… We’re here if you need any help. 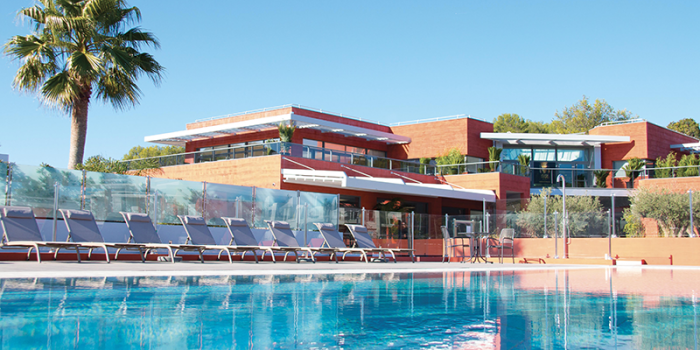 The Mouratoglou Country Club is part of the Mouratoglou Resort. 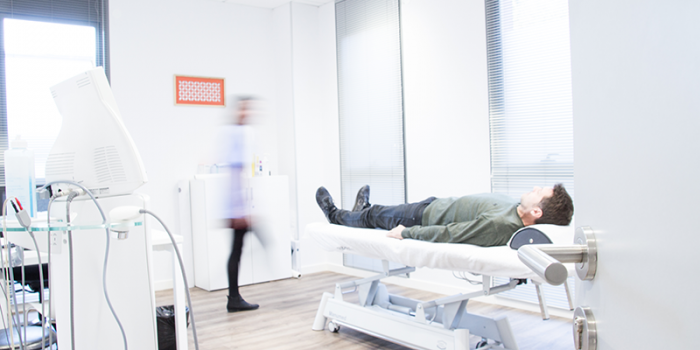 Our professional, dedicated team stands at your disposal to help you perfect yourself, get back in shape and foster a competitive spirit. Classes offered: yoga, pilated, aquagym, etc. 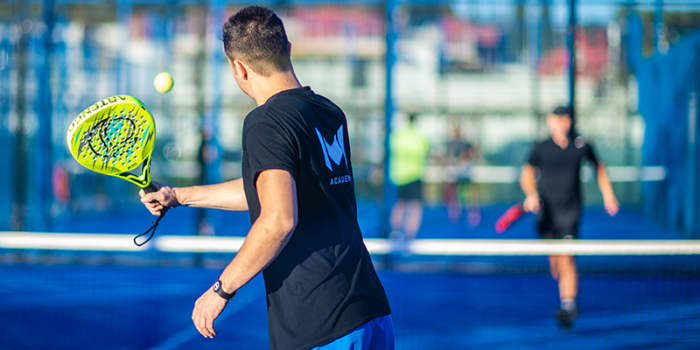 Originally derived from tennis, padel is a racket sport with its own rules. It is played only in doubles, on a smaller court framed by walls and fences. Serves for both our players and the Country Club members. 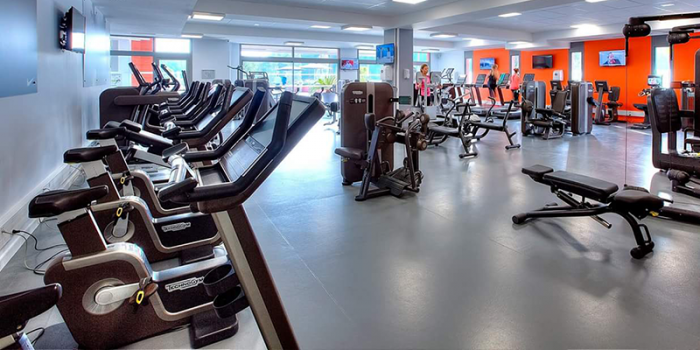 Equipped with the newest equipment to keep your body in shape. 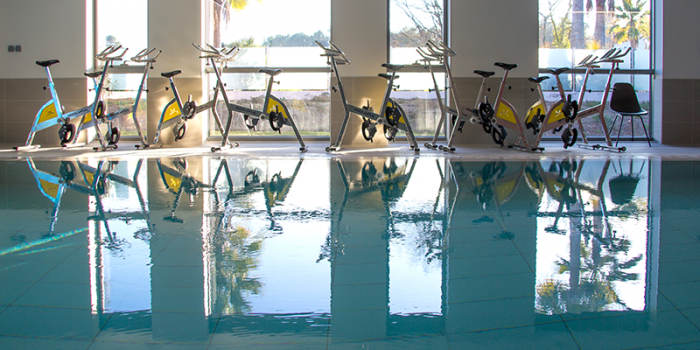 Where the Mouratoglou Country Club’s aquabike and aquagym classes take place. 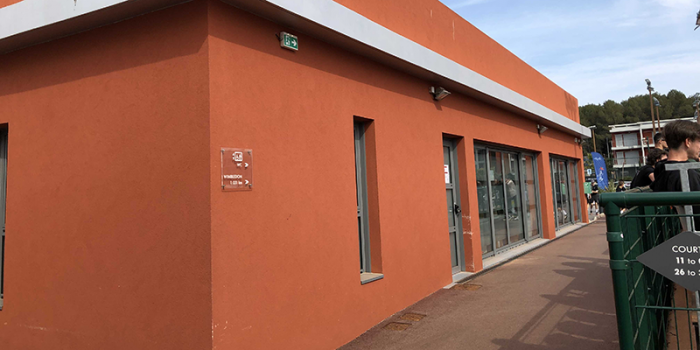 A unique center in Europe, the Sports Medicine Center is dedicated to your health, well-being, injury prevention, recovery and peak performance. Tennispro, a French tennis franchise, has been providing the best tennis products and expertise for more than 35 years. 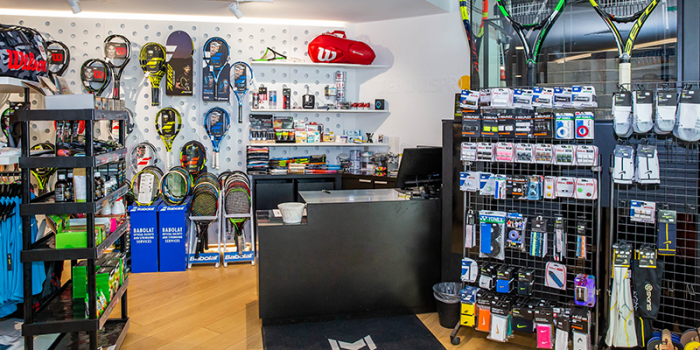 Our technicians Stephane and Olivier will answer any demand you may have and will advise you on the latest tennis products in store.